Overview: He’s the hero of millions, but still the #1 target of the Yancy Street Gang. 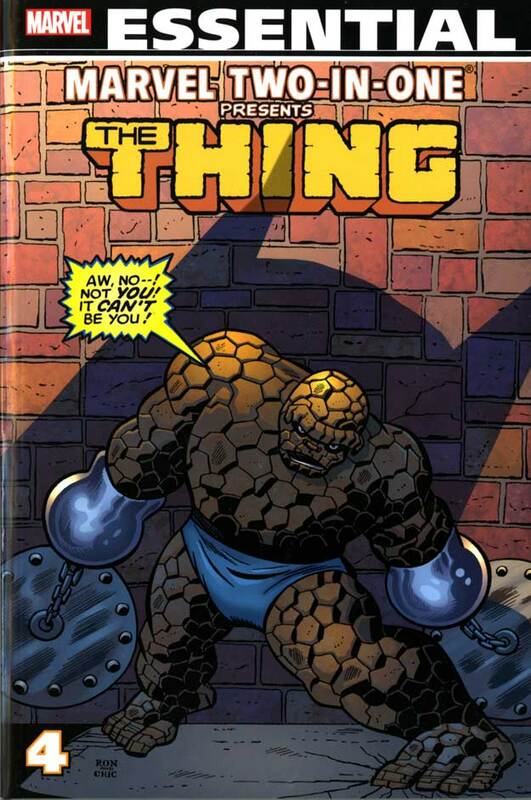 That’s right, we’re back with another collection of adventures of Ben Grimm, better known as the Thing. This is Essential Marvel Two-in-One Vol. 4. As we have seen in multiple team-up collections, the hero of the book (The Thing) meets up with another character that they generally would not be interacting with much in order to stop a villain that they generally would not be interacting with much. That’s how we get issues such as Thing + Machine Man vs. Ultron, or Thing + Captain America vs. MODOK, or my favorite Thing + Sandman vs. Miller Lite. The issues in this book are mostly one-and-done. We do get a couple of multi-part stories, as well as plenty of references to events going on over in the Fantastic Four book. But this book can easily be read without needing to consult dozens of other comics from this era. Sadly, Marvel Two-in-One came to an end during this volume. For the oversized final issue, creator John Byrne came in to revisit a favorite story he did more than four years ago, in Marvel Two-in-One #50. In that issue, the Thing teamed up with the Thing (on an alternate Earth). For issue #100, the Thing revisits that alternate Earth and teams up with Ben Grimm. It made for a nice character study to say goodbye (but not for long) to the Thing’s team-up title. What makes this Essential? : My rule with this blog has been that all of the team-up collections are must reads. I stand by that statement, but…. I’m a little disappointed with this collection. It’s still very good and enjoyable, but it doesn’t match the quality level that we found in Volume 3. The stories seem rather average here when looking back to the Project Pegasus and Serpent Society stories. We do get some memorable issues, but no great stories. Footnotes: Marvel Two-in-One #99 is not reprinted in this collection. This issue features a team-up with the ROM, who Marvel no longer controls the publishing rights for to include in reprints. Marvel Two-In-One #80 – The Thing & Ghost Rider / Essential Ghost Rider Vol. 3. If you like this volume, try: The Thing series that started following the cancellation of Marvel Two-in-One. John Byrne, who was overseeing the Fantastic Four title during this era, was asked to take on Marvel Two-in-One. While Byrne found Ben Grimm to be an interesting character, the stories he had in mind did not necessarily need a guest star each month. So the decision was made to bring Marvel Two-in-One to an end, and relaunch the book as The Thing with a #1 issue. The series ran for 36 issues and can be broken down into three arcs. The first arc covered the first ten issues, looking into Ben’s past and his relationships with his teammates and Alicia. The second arc went from issue #11 to #22, as Ben chose to stay on Battleworld following the end of the original Secret Wars. The final arc from #23 to #36 has Ben back on Earth, but not part of the Fantastic Four. Instead, he spends time traveling around the country and spends some time as a professional wrestler. The first and second arcs have been recently reprinted in The Thing Classic trade paperbacks, although many of the original issues should be easily found in back-issue bins. This entry was posted in Fantastic Four, Marvel Essentials and tagged Alan Kupperberg, David Anthony Kraft, David Michelinie, Fantastic Four, John Byrne, Ron Wilson, Thing, Tom DeFalco. Bookmark the permalink.